A handful of physical extras and a copy of Nintendo Land, too! A new Wii U bundle has been announced for the 2013 holiday season, featuring a Wii U Basic system and a Skylanders SWAP Force starter pack, which includes Portal of Power, three figures, trading cards, stickers, and Nintendo Land on disc. A bit of a grab bag of goodies, but we're not complaining! 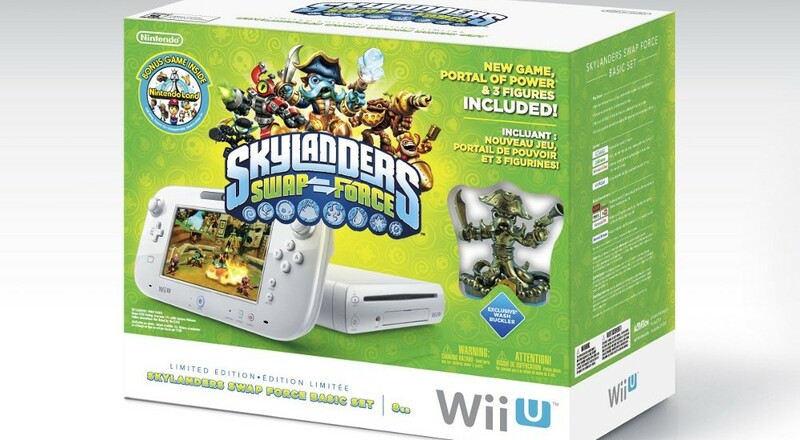 The Skylanders SWAP Force Wii U bundle is set to launch November 15 for $299.99. Do your best not to think of it as a PS4 competitor, even though the release dates happen to be the same. In addition to the standard copy of Nintendo Land and some physical extras, the bundle packs three action figures to scan into the game and swap around: Ninja Stealth Elf, Blast-Zone, and a color-shifted Washbuckler. The starter pack would cost around $75 on its own, so it actually is a bit of a deal, all things considered. As for the game, Skylanders is about bringing physical toys to life inside of a video game. With SWAP Force, the idea is to mash all of those things together to make new creations. As cool people of the 21st century, we're pretty much all right with the idea of splicing two life forms together to create unholy creations. Skylanders SWAP Force plays on this mad scientist tendency and allows players to take the top and bottom halves of characters and mix and match them like so many LEGO bricks. The bottom half dictates how a character moves, while the top determines attack type and style. As you can probably guess, some combinations are more fruitful than others. But don't let that stop you from putting tentacles on everything.